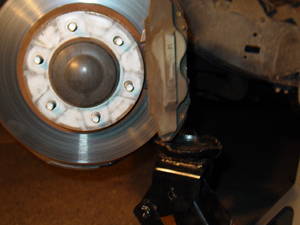 This assumes you already have supported the vehicle on jack stands, removed the tires, and spring/shocks. Donahoe didn't include any detailed removal directions, so here you go. Driver's side shown; passenger is identical. 1. 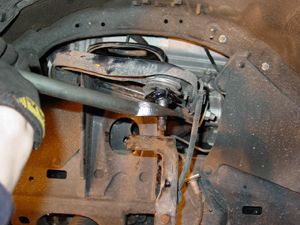 Support control arm assembly lightly from brake caliper. This keeps everything from rotating once the tire rod is busted loose. 2. 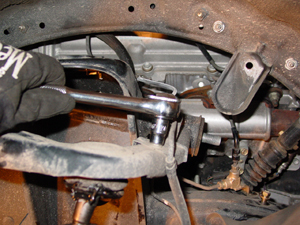 Remove pin and nut from bottom of tie rod. 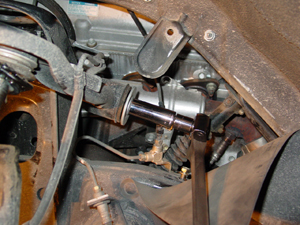 Separate spindle arm from upper control arm. You can use a puller, but since the Donahoe UCAs come with new tie rods it's much quicker to pound a separator in there and pop it loose. This destroys the grease boot, but that's ok.
3. 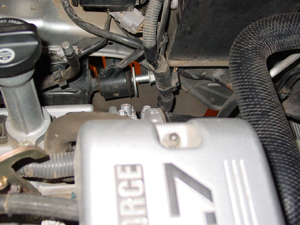 Remove the 10mm bolt on top of of the stock arm that holds the ABS sensor wire bracket. Save bolt for reuse. Be careful when you reinstall it on the DR arm. The holes on mine weren't tapped deep enough so I ended up snapping the bolt head off the first one. I secured it with double sided body panel tape and zip ties. I used washers on the other side to space the bolt so I could tighten it. 4. Pull back top corners of black plastic splash shield on each side of the UCA. 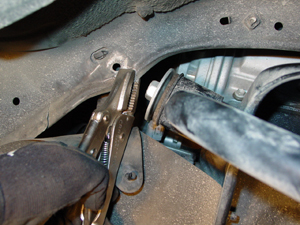 Remove 12mm bolt on frame rail behind UCA and carefully bend the hard brake line junction back and out of the way. Don't lose the bolt. 5. Use a breaker bar and 17mm (I think) socket to remove the nut at the back of the UCA. The other end of the bolt won't spin; no need to hold it. Remove nut and washer and save for reuse. 6. Clearance sheet metal as necessary so that you can remove the bolt, but not the washer, through the front. 7. You'll need to remove the bolt from under the hood. The trick is to leave the large washer behind and just extract the bolt. There's some soft hoses and wire looms in the way, but they can be pushed out of the way. Those of you with dual batterier may not be able to reach this bolt, depending on what your set-up under the hood is like. 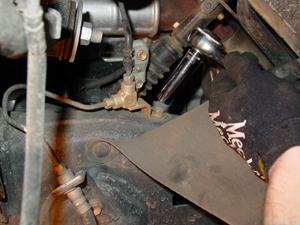 Pull out the bolt and the other washer will drop, along with the UCA. Save bolt and second washer for reuse. 8. Installation of the new arm is the reverse of removal, and is basically covered in the Donahoe instructions. 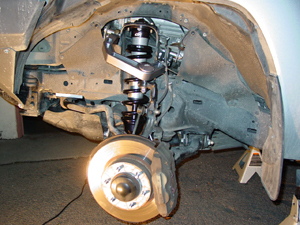 It's also a good time to install your favorite set of Donahoe coil overs. Torque everything to factory spec and you're done! Attached is the UCA installation instruction from Icon/DR. Make sure to read the TQ spec and loctite requirement for the Uniball spacer.